Camp Mungai is a week-long adventure where campers have the opportunity to share in the love and peace of Jesus. We will spend time as a community in song, cooking some of our own food, doing crafts, eating, sleeping--a little, running, canoeing, campfires, being in the outdoors and having lots of fun. Special items to Bring: White t-shirt to tie-dye and lots of energy. so we can make plans for their classes. in Chilliwack BC, August 29 – 31. EVERYONE must register with Debra! Please feel free to share this information with your family, friends, and congregation. 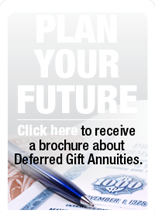 We look forward to working with you to develop an estate and gift plan that meets your needs.